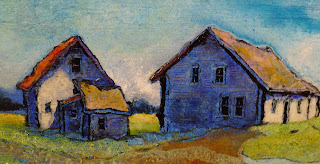 "House and Barns", detail, Andy Newman, oil, 5"x 9"
It is commonly thought that we Americans always want the next new, new thing. From the flood I am learning a different lesson. While I might want the one new thing, many, many new things at once downright perplex me. The celebration of backbone is central to my long standing connection to Andy Newman’s work. Andy isn’t interested in the new thing. Andy is interested in the long term relationship, specifically the long term relationship between a building and the landscape. Andy paints and reveres change and stability of some of our best old barns. The barns, like this historic Village, withstand.